Elijah Daley following in his sisters footsteps took to the pool to compete in the Trillium Cup Short Course Swim Meet hosted by Etobicoke Swim Club at the Etobicoke Olympium. 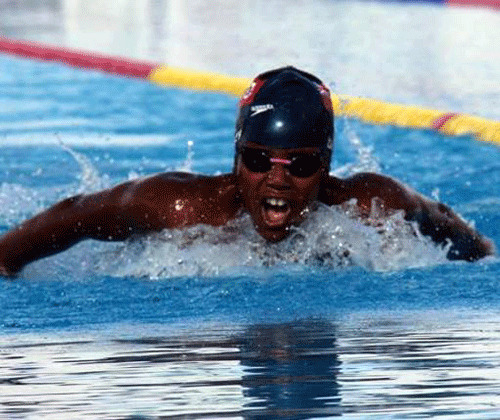 Daley competed in 7 Finals won 6 Gold Medals and he broke 3 Bermuda Age Group Records. Competing in the Twelve Year Old Age Group Daley would win the 400m Freestyle touching the wall in a time of 4:44.91. Daley’s first Record breaking performance came during the 800m Freestyle Final that saw him finish 4th in a time of 9:45.54, which broke Brian Desmond’s time of 10:05.91 set back on January 30th 2016 during the Best of BEST 1st Meet at the BASA Pool. Daley would take more than 7 seconds off the 200m Backstroke Record when he clocked a winning time of 2:25.28, Jack Harvey was the previous Record Holder with a time of 2:32.50 set back on March 12th 2016 during the Schroders Age Group Championships at the BASA Pool. Daley would also win the 100m Breaststroke touching the wall in a time of 1:16.26, with a time of 2:46.70 Daley would also win the 200m Breaststroke. Daley’s Final Record Breaking performance would come during the 200m Individual Medley clocking a winning time of 2:25.59, breaking Sam Williamson’s time of 2:29.80 set back on April 13th 2017 during the Best of BEST 2nd Meet at the BASA Pool. Daley’s Final Gold Medal came during the 400m Individual Medley touching the wall in a time of 5:15.77.